1975 Racing Suits utilized a zip gusset across the rear waist, which when opened allowed the rider to lean forward comfortably in the riding position. When the zip gusset was closed the back length became shorter preventing baggy pants when off the bike, or riding in a fully upright position. 1977 The rear zippered gusset was replaced by an elasticized expander panel. This panel, still used today, allows for “give” in the center back length upon demand depending on the riding position. 1978 Custom Suit customers begin to request that the top of their two-piece racing suits be used for daily street use. The location of the rear elasticized expander panel was moved from above the wasitline on the jacket to below the waistline on the pants. From this the stand alone racing suit jacket is created, and the evolution of the Sportrider family begins. 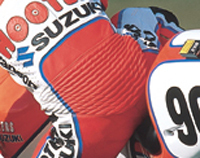 1979 An exterior waistband was added to the jacket section of two piece road racing suits to protect the waist zipper joint. The rear of the waistband was dipped to cover the expander panel on the pants, allowing the jacket to be more comfortably worn as a stand alone garment on the street. 1987 We introduce the Classic Two Piece Road Racing Suit in standard sizes. This suit is offered with a full circumference waist zipper and is used for both street and track use. 1989 Gran Sport suits are built on the Classic chassis. Graphics and colors are added to the line. 1990 Sales of the upper sets – the jacket portion of two piece suits – outpace the sales of complete suits by 2 to 1. 1991 Demand for the jacket portion of the Classic is so strong that we introduce the MANX jacket as a stand alone jacket. No waist zipper, clean and elegant, the Manx becomes one of our most popular jackets. Today the MANX jacket continues as a Traditional Original, the grandfather of today's SportRIDER family. The pant section is also brought forward as a PTCS Canyon Sport stand alone pants. 1992 Advances in Racing Suit technology began to call for protective armor. Vanson introduced the SRX jacket to bring race track proven protection to the street. Building on the the MANX platform, the entire jacket was redesigned to accept armor at the shoulders and elbows. Provision is also made for an optional Back Pad. This new jacket has all new geometry in the sleeves and shoulders to accommodate the armor. Visually the double leather at the shoulders and elbows have new shapes and the wrist zipper is moved to the inseam of the sleeve with a racing suit style wrist zipper placement. 1993 Warm weather riding was completely revolutionized by the introduction of ProPERF leather. ProPerf leather was developed by Vanson for racing suits to combat heat and rider fatigue during hot days. ProPerf jackets were the the first fully perforated, all leather jackets for the street. The “AVENGER Vent system” was introduced to revolutionize seasonal riding. Building off the design conceived by Mike Brown, Vanson engineered and patented the AVENGER vent system to allow the Rider to manage air-flow for cooling. For the first time a rider could control the amount of ventilation and not have either a billowing or oversized jacket. 1997 The COBRA jacket was introduced using the patented “Air Curtain Vent” system.This system uses the entire front panel to flow air – with an adjustable air curtain built into the inside of the jacket. This allowed uninterrupted graphics to be fully integrated into the jacket as all the mechanics of ventilation control are hidden inside the jacket. 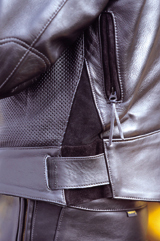 Adjustable Waistbands became standard on the SportRIDER jackets. The inner waistband was constructed using soft suede on the inside to make a more contour following, snug fit that comfortably grips the rider's waist. The PTCS Canyon Sport pants were also upgraded with an adjustable three piece waistband and renamed PTSR – SportRider Pants. 2000 MK2 SPORTRIDER introduced. All the SportRIDER jackets and pants were made with 3-way waist zippers, so pants and jackets can be mixed and matched into track day gear. Shoulder, elbow and knee armor is now standard and upgraded to CE standards, Back pads are optional. All armor is removable and adjustable using our patented “Floating Armor System” which allows unrestricted rider movement while holding the armor is the best protective and comfortable position. .
RamAir sleeve vents are introduced allowing air to be scooped at the inner elbows and flowed up he arm to the armpit area. 2006 CSRR jacket is introduced, as a relaxed fit SportRIDER jacket made for riders seeking the features and protection without the race trim fit of the traditional sportrider. Note: All Vanson ventilation systems are designed to allow variable, controllable air flow over the rider while preserving the fit of the garment. 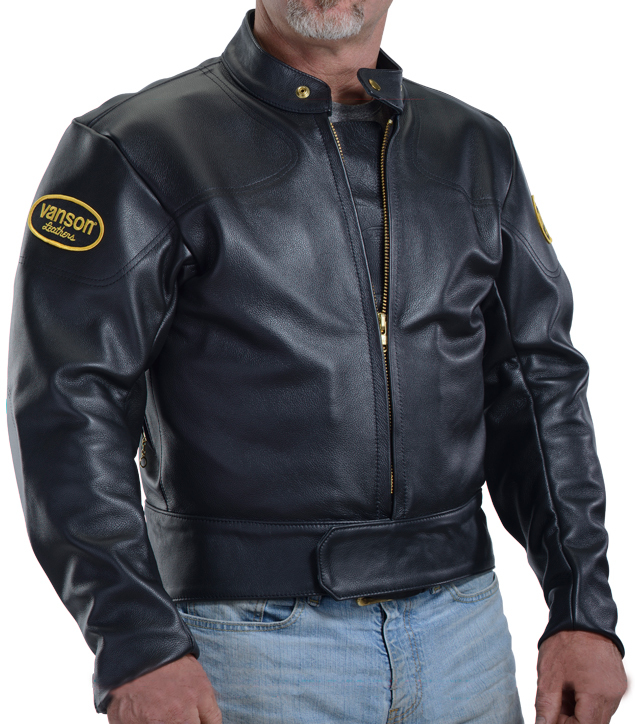 This is critical to keeping the protection areas located over the intended areas, and to eliminate the flapping and billowing common to most other leather jackets on a hot day.